Brightly colored autumn leaves are one of the greatest joys of the season. However, once these same leaves drop off the trees and land on your yard or your roof, they are usually no longer so welcome. 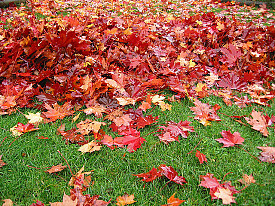 Cleaning up fallen leaves is a time-consuming chore that most homeowners do not enjoy one bit. Here are reasons why this task is necessary and tips to make your work a little easier. While it is by no means mandatory for you to track down and annihilate every last leaf on your property, copious amounts of large leaves like maple or oak will smother your grass and flowers if left as is. In an autumn windstorm, your fallen leaves will blow onto neighboring yards. This is not a popularity booster. Leaf removal may be required by your Homeowners' Association. Fallen leaves can carry diseases such as anthracnose, a type of fungus. Foliage in your roof gutters will cause clogs, which may result in damage to your fascia and soffit boards, as well as rainwater and melted snow backing up into your attic. Eventually, when the temperature dips below freezing, clogged gutters tend to produce ice dams. Clumps of dead leaves on the roof itself will trap moisture, leading the shingles underneath to rot. Prune any trees on your property that have become overgrown. Trimming will not only cut down on the amount of leaves to be shed, it also may offer protection against limbs being detached by winter storms. Be especially vigilant about boughs that overhang your roof. Adjust your lawn mower to cut your grass short in the autumn -- much, much shorter than you would normally do in full summer, when keeping its roots covered is important to hold in moisture. This way, the leaves falling from your trees are less likely to get caught in the grass. Make use of some simple low-tech tools to help with leaf collection. For example, an extra-wide 30" rake with special non-clog tines will simplify and speed up your task. Keep up the good work by utilizing your new utensil to rake leaves onto a tarp. Then use a leaf chute to help load your cargo into brown paper bags for curbside pickup by your municipality. Rake on a still day, if at all possible. Should you not have a choice, work as efficiently as you can by raking in the same direction as the wind is blowing. Raking downhill and when leaves are dry will also spare your strength. As an alternative to bagging, transform fallen foliage into mulch, which will keep tree trunks and garden beds cozy over the winter. Mulch acts to safeguard against harsh temperatures and slows down weed growth too. NOTES: Avoid mulching foliage which has been affected by powdery mildew, rust, or tar spot. Walnut leaves are toxic to certain garden plants and thus not a good choice for mulch. Consider composting fallen leaves to eventually enrich your garden soil. This is easier said than done, because leaves break down quite slowly. However, you can easily speed up the decomposition process by shredding the leaves with your rotary mower. (Just be sure that your blade is sharp and the leaves are dry. Go over them 2 or 3 times.) Treat the leaf shreds as brown material and combine them with nitrogen-rich greens such as grass clippings, in a ratio of roughly 25:1. Compost a variety of leaf species together for the best results.